Kalifornia Love: H&M Haul: Best $1 Goodies Ever!! Last night I stopped by H&M to browse since I had a gift card. I only wanted a dress but at checkout, I saw another girl have these pretty little butterflies and I just had to run back to get a few. A few turned into 14 butterflies, bows, and bracelet sets. I LOVE these butterflies. They can either be hair clips or pins (for clothes, bags, etc.) -they have a hair clip and safety pin attached. They're just so pretty and shiny and colorful -I want to go back and get more! I'm most likely going to use them for my hair (for when I tie it back.) I also bought extra for a giveaway. These were priced down from $3.95 and were $1.00 each. 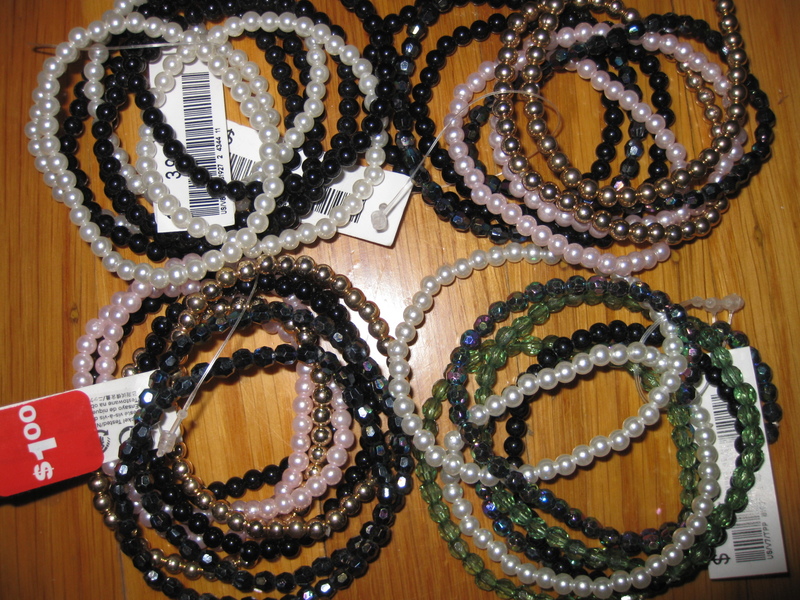 I also picked up these 4 bracelet sets that were priced at $1.00 from $3.95. I'm going to use the beads to make other bracelets, necklaces, combs, etc. I really like the beads -especially for the price! They can even work as a nice little stocking stuffer. And then there were these bows. I used to have lots of bows in high school but stopped liking them and gave them away. Now I like them again! These were also $1.00 each for a pair and were priced down from $4.95. 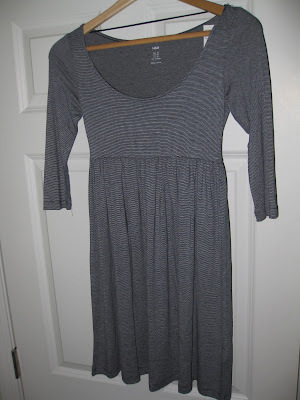 I also got this navy/white striped dress. I love stripes. The dress looks kind of plain but "on", it looks really cute -I love how casual it is. I got this for $14.95. 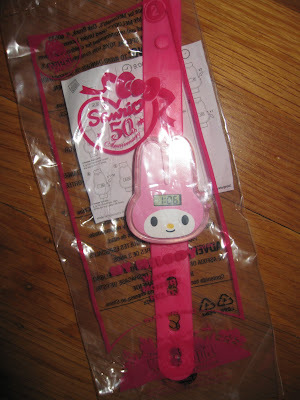 And lastly, I found the My Melody watch!! I just need Hello Kitty now and I'm done! I'm scared though because I think they're sold out everywhere around here. Agh.. plans changed so I didn't get to go. =( BUT I think we're going out later tonight -hopefully. Have a wonderful Friday!! :) Enjoy your brunch date! Those hair bows are a definite must have for me! Nice affordable haul. everyone is collecting those watches. haha. cute! i hope you get hello kitty! The butterflies and watch are too cute!! I haven't seen the bracelets but I want to go back and see what else is going on sale! I really like the bracelets. They are soo cute and $1 is a really good deal. In Hong Kong, you can get lots of these for a very cheap price. Maybe even cheaper than your $1 LOL. 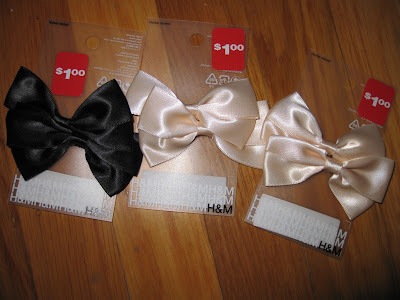 Also, H&M has $1 hair bows right now?! 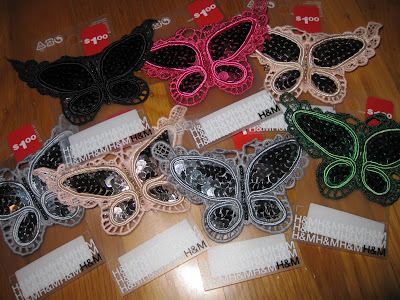 I love your haul posts you always getsuch pretty things on good deals The bows are so cute I used to wear them in school too.Are these butterflies made of crochet?I make these from stocking net and wires and hang them on my shower curtain rod for decoration. Thanks for sharing them with us ahaha. great haul! i love love the bracelets! i'd love to see what you'll come up with the beads! I LOVE H&M! You are so lucky to get such great deals. I'm going to head there sometime next week to check the store out. Too bad its 1 and a half hours away from where I live. @ Jen.. I hope you can find them too. Good luck! =) And my brunch date got cancelled. =( I'm hoping to go soon though! @ aki!.. Thanks. =) I love bows. @ ~Lisa.. Aww.. I really hate how things are so expensive in Canada. Whenever I buy stuff and look at the CDN price, I'm so so amazed because it's so overpriced over there. @ Pamela.. I really want to go to Asia.. Under $1 is pretty cheap! I REALLY wanted to go to the game and had my heart set on it for months (since the day Lebron announced tha the was going to Miami.) But tickets were crazy expensive. The upper bowl tickets weren't as bad but I didn't think it was worth paying a semi-hefty price to sit in the upper bowl and just watch the screen (when I can do tha tat home.) Also, GS was going to get whooped anyways! BUT I really did want to go. =( I told my bf that because I missed this game, I am NOT going to miss it when the Bulls come. I want to see D Rose!! @ Rinz.. Head to your H&M!! Maybe you can find some too. =) I kind of just stumbled upon these since I saw another customer who had a bunch -definitely lucked out! @ Amy.. Go get a watch! They're anywhere from like $1.65-$1.85 (these are the prices they told me at various locations I went to.) If they're nice, they'll give them to you free. But you can always get a happy meal..
Yupp! Well at least mine does. Check yours! @ SiSi Sparkles.. Thanks. =) I'm loving the bows too and can't wait to use them. @ alvira.. I'm really glad you like the haul posts. =) Sometimes I feel like I do too many hauls -I do them when I'm busy because they're quick and easy to write up. Umm.. I'm pretty sure they're crochet. The outer part of the wings show the crochet detailing and inside the wings are sequins. That's really cool that you can make these -I've always wanted to learn how to crochet. I'd love to see your work. @ Jo.. Just be sure to always look out for deals everywhere you go. =) Sometimes stores are sneaky when it comes to sales. @ snow0016.. I need to figure out what to do with them to! I haven't made any jewelry or hair accessories in forever since I've been so busy with school. I do love some of the bracelets as they are though -just have to make them smaller since they're a little big for my wrists. Thanks. =) I need to start wearing them!! Really love the butterflies and bows.. wow just $1!